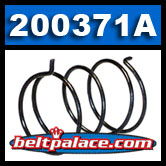 Comet 200371A "Black" TC88 Series Spring (for 6" or 7" Driven Clutch). Comet TC88 Series part. Comet 200371A. 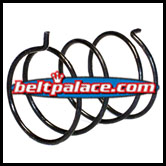 "Black" TC88 Series Cam Spring (for 6" or 7" Driven Clutch). Replaces "black" tension spring in Comet 88D6 and 88D7 Driven Clutch (axle). The Comet TC88 Series Torque Converter System is obsolete. Genuine Comet Industries Parts available here.